Although described as: "A new quality product of the Ball Machinery Company, 939 West lake Street, Chicage, Illinois 60607", the geared-head 5.75" centre height by 27.5" between-centres Harmal lathe would not have been manufactured by this machine-tool distributor. Instead, it was probably on one the earlier imports from Taiwan (the apron controls match those of the 1970's "Generic" belt-drive and geared-head lathe from that country), possibly from Czechoslovakia by Volman (their "Robot" lathe was of similar layout) or perhaps, as suggested on the Antique Machinery Forum, from Brazil. As a note of interest, other sizes of Harmel lathes are known to exist, some branded "Snap-on Tools". Notwithstanding its origins, this appears to have been a well-specified lathe with its 8.75-inch wide and 6-inch deep bed flame-hardened and carrying V and flat ways. The lathe was supported on a robust, cast-iron stand that incorporated a chip tray, coolant equipment and a small storage cupboard at the right-hand side. 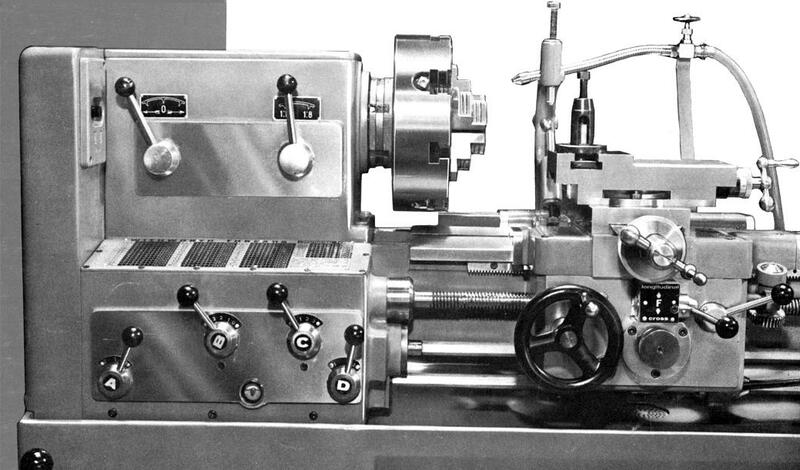 Like a number of previous and contemporary lathes from various makers, the front V-way had a narrow inside face set at a steep angle to absorb tool thrust while the much wider outside face was set at a shallower angle to better spread the load and so (it was claimed) extend the bed's life. Similar in layout to many lathes of decent quality manufactured from the 1940s until the 1960s, the spindle speed-change system was carried inside the stand, beneath the headstock. A 2 h.p. motor was used driving, by a pair of V-belts, a speed-change gearbox that held hardened gears running on splined shafts turning in ball races and lubricated by splash. Drive to the spindle was another pair of V-belts - though instead of turning the spindle directly, the belts passed around a pulley that ran in its own bearings with the drive transmitted by a peg. The belts ran in its own sealed compartment, isolated from the lubricant used in the gear chamber at either side. 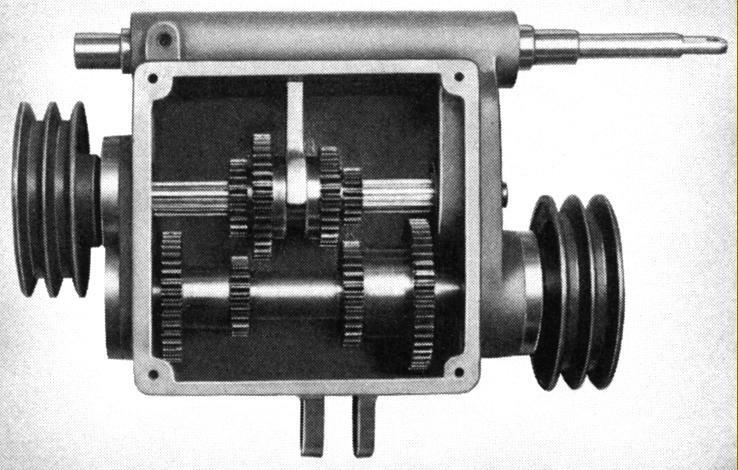 This spindle drive arrangement, when running in direct belt drive, was claimed by several makers to isolate the spindle from the effects of belt pull while also reducing the transmitted vibration that could produce "gear marks" on finely-finished work. 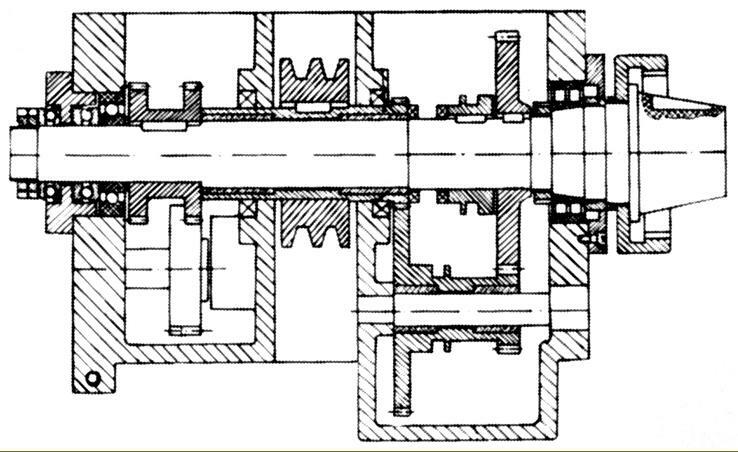 For slow speeds the headstock incorporated reduction gearing, operated by a high-low speed lever on its front face. A second lever, to the left, operated the "tumble reverse" mechanism by which means the carriage could be moved, under power, either towards or away from the headstock. Control of the electric motor was by the handy "third-rod" system - the operating handle pivoting (as usual with this design), from the right-hand face of the apron. Eight speeds were provided in geometrical progression: 54, 90, 150, 250, 432, 720, 1200 and 2000 r.p.m. Made from a hardened and ground chrome nickel steel, the 0.1875" bore spindle carried a No. 4 Morse taper socket nose and an American long-nose taper in an L00 size. Bearings were an adjustable, double-row roller at the nose and a pair of ball races at the rear, one being a double-ball type to take thrust and the other a single row to absorb radial loads. Fitted as part of the standard specification was an enclosed, all-lever operated, oil-bath lubricated screwcutting and feeds' gearbox - though sadly the seller's catalogue mentioned neither the pitches available nor the rates of feed that were available. However, from the evidence that three screwcutting and feed charts were attached to the box and four controls provided, it's likely that a useful range of both inch and metric threads could have been generated. Double-walled and oil-bath lubricated, the apron incorporated a mechanism by which means a single lever was used to both selected and engaged either the power sliding or surfacing feed - this arrangement being common on other Taiwanese lathes and also used, from the early 1950s, on the English Kerry. Unfortunately, though working through low gearing, the carriage handwheel was rather small, making fine control more difficult than might have been the case with something rather larger. 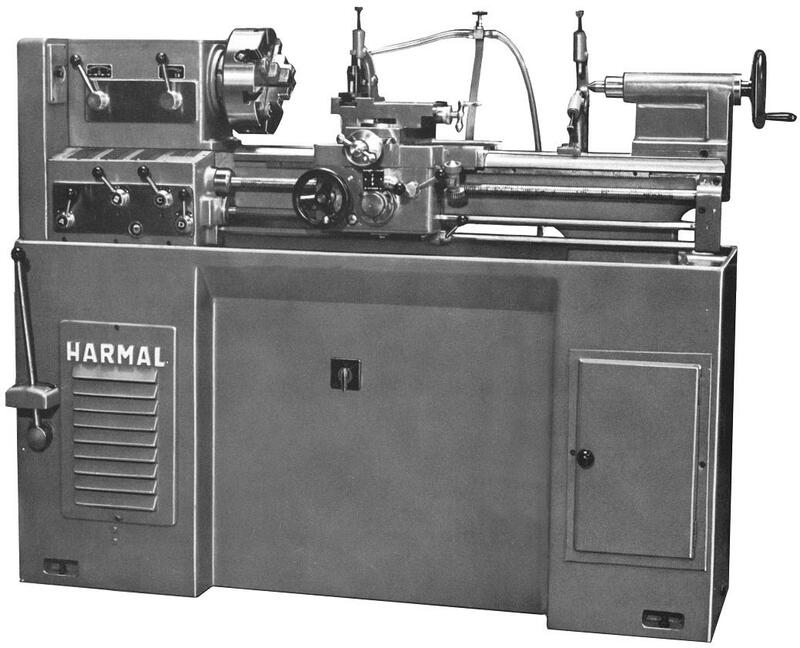 As with most lathes that undercut the price of home-produced machines, the Harmal was issued with a decent range of standard equipment: fully installed electrical controls together with the 2 h.p. 3-phase motor; a 9-inch independent 4-jaw chuck; fixed and travelling steadies; a thread-dial indicator; extra changewheels to extend the threading range; a step-down spindle sleeve and two Morse taper centres. 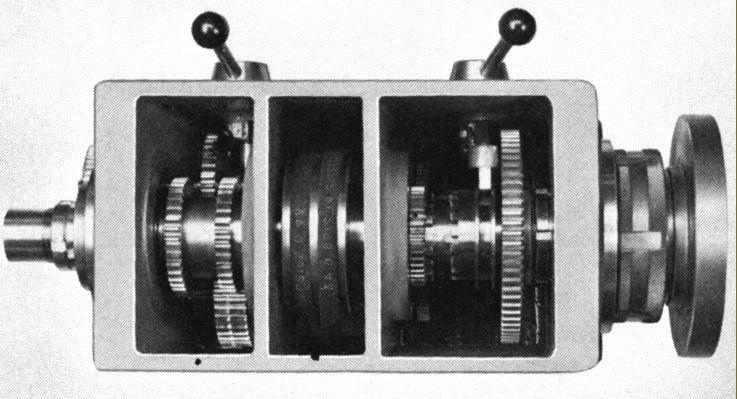 The range of optional extras included a taper-turning attachment; 6-station bed-mounted capstan unit; 10 and 8-inch faceplates; a micrometer carriage stop; a number of 3-jaw chucks and several collet systems ranging from simple draw-tube operated types to a proper production type ball-bearing-supported, quick-action lever closer. .